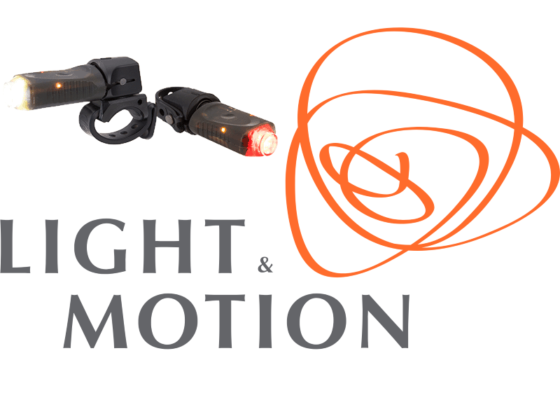 When I think of a “smart” device, my thoughts would not generally include a bicycle headlight and taillight like the $99 (SRP) Light & Motion Vya Pro Commuter Combo. But what if those devices included sensors that change the behavior to change light output, and even turn on and off based on whether you are on the bike? To me, that level of automation meets the definition of a “smart” device quite cleanly. After all, isn’t delegation and convenience the ultimate goal of a “smart” device? Packaging is minimal for the Vya Pro Commuter Combo, but there is not anything wrong with that. Alongside the smart lights, basic mounting hardware is included. If you are planning to use a GoPro style mount for the headlamp, Light & Motion has a handy adapter available for a few extra dollars. Of course, Light & Motion are not alone in this sort of disingenuousness, but as the lights require the mounting cap to function, it is a step too far. That said, adding it all up, the extra weight is not too horrible, relatively, at least on the headlamp side. It is quite easy to find a taillight which provides a similar lumen output in a much lighter package. Mounting the headlight is easy and straightforward, assuming you have a round handlebar or stem. The GoPro mount is a reasonable alternative if neither of those is available, or if you’d rather not illuminate the bike computer from the stem. Similarly, the taillight was clearly designed with the completely round seat post firmly in mind as well. While this is still the norm on many bicycles, both of my current road bikes have a flat back seat post. One narrow, the other quite the opposite. The problem is that when riding, the mount tends to shift to the side when pointed straight back for optimal visibility, eventually coming in to contact with the leg. Pointing the light downward is a workaround, as it will stay in the right place while also providing decent “been seen” functionality. Even funkier shapes are prevalent with the seat post of many high-end aero road bikes, so it is disappointing that Light & Motion does not seem to have a great option here. Charging happens via USB. Anything with a female USB type A input, and power can do the business. Whether that is a standard charger or a PC. Charging status is indicated by the lights on the side of the lamps, with solid indicating “done”. These lights also indicate battery level, but they are a poor marker. First, because it is really easy to miss it when finishing a ride, and second because of the two hour life span of the headlight (claimed is 120-360 minutes depending on mode). It will, rightly, indicate that it is fine at the beginning of a ride, and then die an hour later right as it starts getting dark. So if you ride for more than two hours at a time, or do an hour in the morning and an hour at night (e.g. commuting) and cannot charge it up in between, this is not the light you are looking for. Also, as a compounding annoyance the shape of the lamps makes it impossible to place them next to each other in a charging block or the back of a PC. Turning your 4-6 port charger into a two port charger. Unless you source your own USB type A-to-A cables of course, which frankly should be included given the asking price of the Vya Pro Commuter Combo. Now on to the smart bits :). 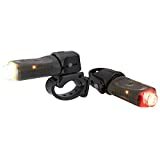 Both of the lamps will operate in either day or night mode, with varying function and output based on the mode: 200-250 lumen for the headlight, and 100 lumen for the taillight. See below for examples of both. The other bit of smart, comes from the lamps ability to turn themselves on/off based on whether you are on the bike. Don’t worry about them turning off at a stoplight though, even the small movement you cannot help but make when touching the bike is enough to keep them going. Then to save battery, after about 30 seconds, they will turn off automatically. Enticed by the allure of “smart” bike lights and their svelte claimed weight, I eagerly grabbed up the Light & Motion Vya Pro Commuter Combo to use with my road bikes. Unfortunately, while the smarts are present in the lamps, I’m not as convinced about the intelligence of the product as a whole. Taillight options are not great for either of my bikes, although I really like the availability of a GoPro style mount for the headlamp. But mostly the battery life of the lights, especially at the front, is a massive disappointment. Based on the specifications, I was expecting more than the roughly two hours, regardless of daylight conditions, I am able to get from the headlamp. Which means it has to get charged after every ride, and on a longer ride it would have to hangout in the jersey until absolutely necessary to ensure that there is enough juice to make it to the finish.